One of my favorite chocolatey “candies” are mallomars. I love everything about them: the cookie base, soft marshmallow center, and the rich chocolate shell. Everything. 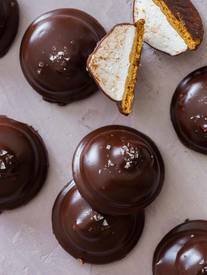 This year we have our own version of mallomars, our Salted Gingersnap Mallomars! I thought it would be fun to replace the traditional shortbread cookie base with a spicy gingersnap cookie! You can totally make your own cookies, but we decided to speed up the process by buying some at the market. We also finished ours with a little touch of sea salt, because who doesn’t love that…seriously? !